Notocactus arechavaletai v. limiticola HU179 Sant'ana do Liveramento, Rio Grande do Sul, Brazil. Sant'ana do Liveramento, Rio Grande do Sul, Brazil. Description: Plant at first solitary that matures and flowers at an early age. With time it form small colonies. One of the peculiarity of this species is the tendency to produce basal suckers on the lateral roots. The "limiticola" is merely one of the several forms of N. ottonis that is a common species which occurs over quite a wide area and in consequence of that shows a great variability. Stem: Up to 8 cm in diameter, 4 cm tall, somewhat depressed, with white wool apically, more or less glossy green or bluish green which can take a purple colour in under stress condition or in full sun. Ribs: 8-9, broad and rounded, well defined. Areoles: Few, circular up 1-2(-3) mm wide, 10-12 mm apart. Spines: Bristly, acicular, slightly curved and spreading. 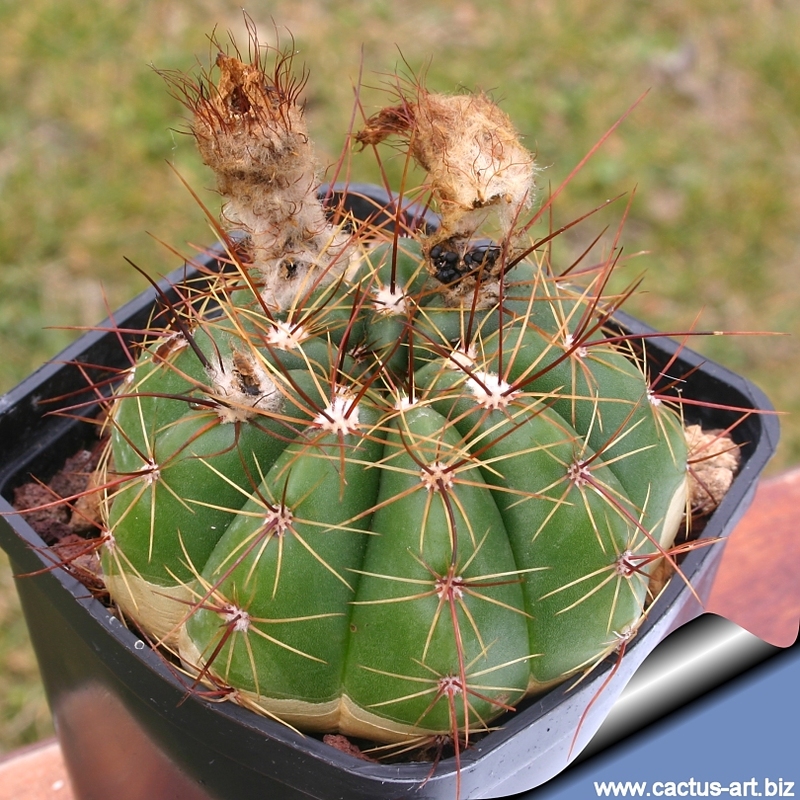 Central spines: Up to four, brownish, reddish brown or yellowish 20-40 mm long. Radial spines: 7-9 up to 15 mm long, clearer. Flowers: Yellow from the uppermost areoles, one or more appearing at a time, that open only during the dayt, 5-6 cm wide, floral tube with brownish wool and bristles. Perianth segments linear-oblong, acute, stamens about half the length of the perianth, segments, style yellow, stigma lobes red. 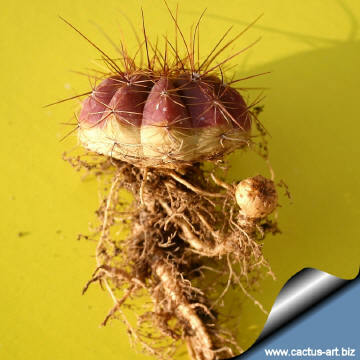 Fruit: 0,9-12 mm in diameter, ovoid to short cylindrical, thick walled, deishent often with large number of seeds. Etymology: Mud or marshes, inhabitant of, found growing near marshes. Root suckers arise from adventitious buds developing on the root system. Cultivation: It is easy to grow. It prefers a neutral to slightly acidic mineral-based potting mix with plenty of extra grit and feed during the summer. It likes a warm bright location, does great in partial shade but doesn't like full, hot blazing sun in the central summer month. Can support quite some water during the growing season but pot plants in winter are wet-sensitive and needs to be kept dry (rots easily if soil is wet and cold) tends to lose its roots in winter. Water Best if watered with rain water. 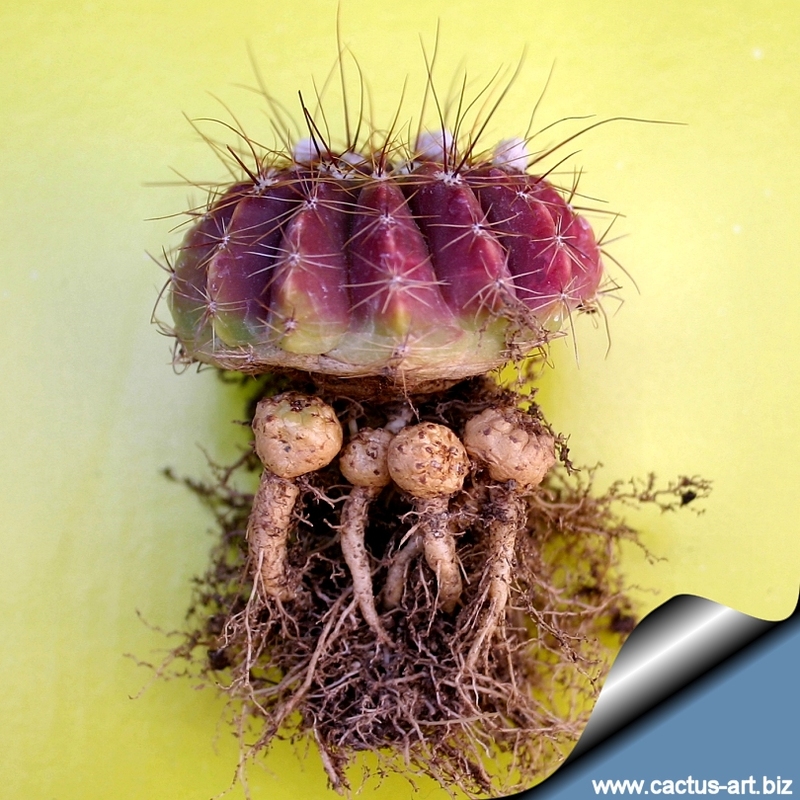 Usually it is recommended to over-winter this plant in a bright and warm greenhouse with at least 8-10° C and rather dry (it tends to lose its roots and to rot if the substrate is wet and cold) but it has proved to tolerate temperatures as low as -5° C for short periods. It is susceptible to spider mites, so it should be check once in a while for it. ROOT SUCKERS: Root suckers are new shoots that arise from adventitious buds developing on the lateral root system of many plants species. They are however a quite rare kind of vegetative reproduction strategy in cactus family, but occasionally occur in some cactus species when roots have been injured or felled, Notocactus arecavaletai this is one of the few specie that produces naturally a large numbers of them and can develop into a small colony. The suckers have the potential to develop rapidly, fed by the existing root system. Often sprouting results in multiple stemmed plants.